The 11 surviving members of the 1948 Irish Olympic team were honoured at a special medal-giving ceremony in Dublin today. 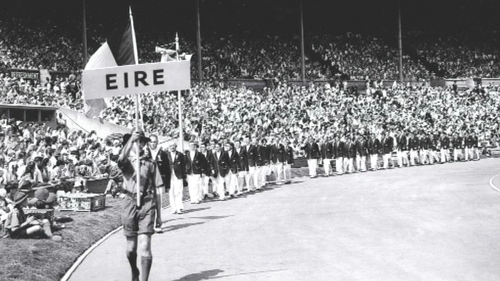 83 participants represented Ireland at the 1948 London Olympic Games - 78 men and five women. Eight of that team received the special Olympic medals-of-hounour in person at the ceremony at Farmleigh House today - family representatives accepted medals on behalf of the other three Olympians who were not present. The eleven surviving team members are as follows - from the athletics team - Jimmy Reardon and Cummin Clancy; from the swimming team - Paddy Kavanagh, Ernest McCartney and Paddy Condon; from the basketball team - Harry Boland; from the fencing team - Dorothy 'Tommy' Dermody; from the football team - Brendan O'Kelly; and from the rowing team - Morgan McElligott, Denis Sugrue and Robin Tamplin. Of the five women in the Irish delegation, four competed in the art competition which no longer takes place. Only one Irish woman competed as an athlete - Dorothy Dermody. She did not attend the ceremony - she is now 103 years old. Ireland won just one medal at the 1948 games - 69-year-old Letitia Hamilton from Dunboyne won the bronze medal in the art competition for a painting of the Meath Hunt Point to Point Races. The location of that winning painting today is unknown but its believed to be somewhere in the United States. The 1948 Olympic games in London were the first after a forced 12 year break because of World War II. The themes were very much 'V for Victory' and 'Peace and Sportsmanship'. The surviving members of the Irish team remember politics playing a major role in the Irish delegation aswell. There were disagreements over whether the team should be a 26 or 32 county one. Part of the delegation was even sent home such was the level of disagreement. There was also an issue over the banner the Irish team was given to march under at the opening ceremony. The organisers gave the Irish team a banner with the word 'Eire' on it. The team manager refused to march under this banner, saying the country was called 'Ireland' and he wanted a banner to reflect this. With just minutes to go the team capitulated and marched under the Eire banner because of the large number of Irish sportsfans in Wembley stadium who had come to see them march in the opening parade. The swimming team could not take part in the opening ceremony parade as the national swimming organisation had not provided the athletes with suitable gear to wear. The 1948 Olympic games were the first to be shown on television in Britain, however its unclear just how many people got to watch the games as the vast majority of people did not own a television set at that time.